The 'Champions Classic' tips tonight, helping kick off the 2018-19 NCAA regular season in style. No. 10 Michigan State will take on No. 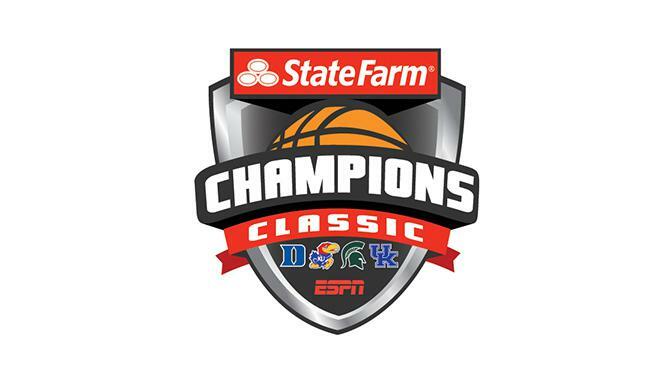 1 Kansas at 7:00 EST, followed directly by No. 4 Duke vs. No. 2 Kentucky. 31 alumni from the NIKE EYBL will be dressed for the game, an average of just under eight per team. 20 different NIKE EYBL programs have at least one alumni in the event. Michigan State has a NCAA-high 10 EYBL alumni on their roster. Kansas has eight, Kentucky has seven and Duke has five. Scroll down for a complete look at the EYBL alumni participating in tonight's Champions Classic.